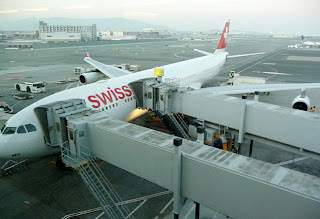 One of the other moms who chaperoned the Switzerland trip is also a frequent traveler, and we were both eager to fly SWISS for the first time when we departed for Zurich last month. Given the Swiss proclivity for civility and orderliness, we both imagined wide passenger seats with generous legroom, or perhaps electrical reclining mechanisms, or maybe lavatories you could turn around in. But alas, the plane was a standard Airbus A340 with no particular upgrades and slimline economy class passenger seats, which I swear every time I fly are getting narrower and narrower. The girls did enjoy a feature that is now mostly standard on overseas flights: the in-seat video on-demand entertainment system. (Since he was 6 years old, this is the first thing my son asks before we get on an airplane . . . will there be a personal video screen in the seatback in front of him?) A large selection of feature films, television programs, and in-flight specials were offered on our SWISS flight and most of the girls watched movies back to back for both the entire 11 hour trips. Personally, I was very impressed with the removable power remote. You know how compromising it is when there's a stranger in the seat next to you and every time you want to change channels or adjust the volume on the shared armrest, you run the awkward risk of accidently making physical contact with that person? Well, not on SWISS! Instead of being integrated into the armrest, the remote control is removable, as shown below, and can stay in your possession throughout the flight, meaning only the dreaded lavatory break lap-crawl-across-your-row remains as undesired intimacy with strangers. We were all impressed with the in-flight service. On an 11 hour flight we were served three meals, and they weren't too bad. During the hot dinner service the flight attendants actually came around with a basket of extra bread rolls for us lowly coach passengers! Snacks such as mini Toblerone bars were served, and warm, moist handtowels were distributed near the end of the journey. The flights departed and arrived on time and didn't lose our luggage . . . all in all, an A+ airline! I agree, SWISS is one of my favourite European airlines as well.